Yes, he is summoned, and no less real for that. A very tangible manifestation of this demon and his influence is described by Edgar Allan Poe in his uncannily beautiful poem, "The Raven." Making masterful use of his gift for consonance and cadence, Poe has, within seventeen stanzas, depicted as powerful a description of a descent into the pit as to be found outside Dante's Inferno. The poem begins by describing, in the first person, a man distraught with grief. In the midnight hours, caught up in a dark and desolate meditation from which he vainly seeks distraction among his books, he suddenly hears a rapping at the door. His mood, already morbid, is excited into terror. Flinging open the door, he finds only the bitter emptiness he had been trying so hard to shut out moments before. Into this darkness he whispers the name of his beloved Lenore. The terror and wonder that he feels, the daring dreams he entertains, are all expressed in that one name. He has dared to believe that somehow she has returned to him from the dead. The name is echoed back into the stillness of the night and he returns to his room, his soul still burning with the idea of seeing his beloved again. Poe uses the language so well to describe this chamber wherein haunting grief casts its gloom from the fire's dying embers and clings to each sad curtain, that one finds the man's obsession with death not at all unnatural. Unremitting sorrow has transformed this library into a mausoleum where all wisdom lies entombed with the books, bereft of any power to comfort the living, and the very furnishings seem to be draped with a shroud. The scene is set, the summons has been issued, the emissary of spiritual desolation awaits. The tormented man, rationalizing that some perfectly natural phenomenon has been responsible for the rapping sounds, hears that sound once more, this time from the window. Betraying his emotion by the rapid beating of his heart, he flings open the window and the Raven flies in, alighting on a bust of Pallas above the door. Pallas Athene, pagan goddess of wisdom, is symbolic here of human reason, learning, and the arts. Apparently she is an ineffectual diety whose powers earlier proved insufficient to lift this tragic man, even briefly, from his mournful state of mind. Now the ill-omened Raven sits triumphant above her. Like the allegorical Virgil in Dante's Inferno, human reason is limited and without divine aid and can ultimately be surmounted by evil. The man's initial response to this black-plumed apparition is one of contrived amusement. Though deceptively light in the tone of his greeting, the man's words belie his seeming indifference from the outset. He hails the Raven as having originated from the "Night's Plutonian shore." Pluto, another pagan deity, was lord of the underworld, the realm of the dead. The Raven comes recognized as an agent out of the land of darkness and death. Upon being asked its name, the mysterious entity responds with the single word, "Nevermore." Hearing this word intoned as the funeral dirge for the hopes of another miserable soul, this morbid man will not be long in taking the demonic anthem into his own heart. Borne upon the breath of Hell, this perverted hymn to despair will be repeated again and again, until the hearer is driven to madness. The siren song which tempted Ulysses to hurl himself into the sea could not have been a deadlier temptation than this nor could it have required more restraint. Hope does not fly of its own accord or die a natural death. We starve hope by fixing it on an object which cannot sustain it. When people die or dreams perish, we sometimes wish to bury our hopes with them. Despair comes with our invitation to shovel the first spadeful of earth onto the face of the deceased. As Christ descended into Hell to bring out those who had fallen therein, so will our hopes be resurrected and transfigured. If the demon of despair can drive out our hope in Christ, we are indeed lost. Enraptured by the angelic imagery in which he wishes to enshrine his dark visitor, the man concludes that God has sent this messenger with the gift of forgetfulness. His vision of respite from memories of Lenore is quickly shattered by the Raven's unchanging utterance. He shall taste the cup of blissful forgetfulness "nevermore." Now desperate, the man pleads with the Raven to prophesy his release from sorrow. Pursuing his earlier self-deception that the Raven may be a divine messenger but patently not caring whether it comes from the Devil himself, the man questions the bird twice more. As wretched Saul implored the witch of Endor to summon up the shade of Samuel; as that fallen king did seek the aid of evil to hear the voice of the dead; so does this man call upon darkness to echo his own certain knowledge of destruction. Is there any healing of grief in this life? Despair answers, "nevermore." Will we ever greet our loved ones in Heaven? The refrain of "nevermore" is assured. The demon knows but one answer. Descent into the abyss must follow swiftly. As the man tries futilely to rid himself of the Raven, he finds despair not so easily thrown off. This demon, when we allow it, fastens onto our souls and relentlessly squeezes every drop of hope from our spirit. The juiceless pulp goes on living then, eternally tormented, eternally thirsting for what can never be, perhaps even for what never was. The intensity of this poem certainly suggests genuine mourning, passionate grief, and bitter sorrowing. Is it possible to grieve so much over the death of an illusory ideal? Have we not all, like Icarus, flown our dreams a bit too close to the light and heat of reality, and watched as the pinions fluttered away, falling surely to our own destruction? Have we not watched our self-centered ideals rise like fantastic flying machines borne aloft by some capricious breeze and then, unable to sustain their own weight upon such fragile wings, plummet to the ground and perish in flames? Did we not cry and mourn among the ruins and ashes as passionately as though we mourned our beloved? God be praised that in His infinite mercy, He gave us more to hope for than what we are able to create in our imaginations. What is born must die; what is given over to Christ will transcend even death. "Verily, verily, I say unto you, Except a corn of wheat fall into the ground and die, it abideth alone: but if it die, it bringeth forth much fruit" (St. John 12:24). Though Lenore was born in Poe's imagination, her smile could only find expression on the faces of real women. Conversely, the very real demon of despair had long been etching its image into the poet's soul. "The Raven" was written as a cry from an inner darkness. To dwell in darkness of the heart as a lost and fallen man was a choice Poe made. The heart is not uncharted territory. Christ descended into these depths, too, that we might be brought forth, out of ourselves, and out from under the shadow of despair. 1. Alexandrova, N., "Elder Nectary of Optina," The Orthodox Word, No. 129, 1986. 2. 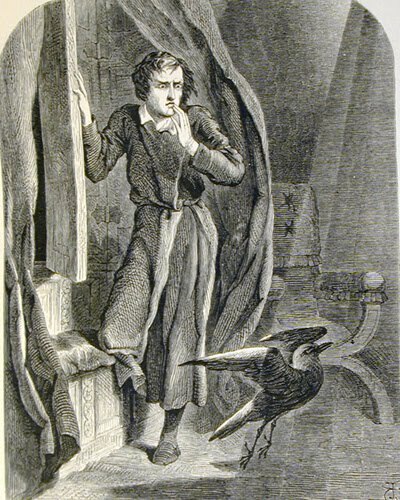 Complete Tales and Poems of Edgar Allan Poe (New York, n.d.), p. 944. 3. The Ladder of Divine Ascent, tr. Archimandrite Lazarus (Moore) (London, 1959). 4. Complete Tales, p. 945. 5. C.S. Lewis, A Grief Observed (New York, 1961). 6. H. Allen, Israfel: The Life and Times of Edgar Allan Poe (New York, 1934), p. 488. 7. Complete Tales, p. 946. 9. Fifty Spiritual Homilies of St. Macarios the Egyptian, tr. A.J. Mason (London, 1921). Source: Orthodox Tradition, Vol. 5, No. 1 (1988), pp. 28-33.